The Treetops Traditional Standard Pent Shed is available in a range of sizes. This one is a medium size building, offering plenty of storage space to suit most people’s needs. It is constructed out of superior quality Redwood timber. A thick Shiplap tongue and groove build gives the shed an impressive weather-resistance. 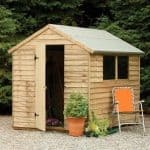 What you’ll find with sheds from this collection is that the interior is just as impressive and solid as the exterior. Tongue and groove is used throughout, giving it an incredibly rigid design. It will easily withstand daily wear and tear and keep your storage safe and dry whatever the weather. It is the customisation options for the door and window that really stand out. Treetops Traditional is the only manufacturer that offers such extensive customisation options with their garden sheds. It allows you to choose a design that best fits your needs. As sold the shed comes with 1 fixed horticultural glass window and a single well-hinged, well-braced door. A pent roof ensures you can install the building in any part of the garden, regardless of any height restrictions you may be facing. All in all this is one of the best quality, value for money sheds available. Built to an impressive standard, it is guaranteed to last for a long time to come. The unpainted rustic design might not be to everyone’s taste. 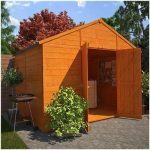 However, coloured treatments or paint can help you personalise the shed to better fit your preferences. This is a superior quality storage shed from Treetops Traditional. Available in a wide range of sizes, this model offers enough space to store bicycles, lawnmowers, step ladders and other gardening essentials. It comes with a very tall design, making it great for tall item storage and also increasing its practicality and comfort. One measurement that stands out with this range is its extra wide door. Whilst you can upgrade to larger 4’ double doors, the single door supplied as standard offers a wider entry than many of its competitors. The roof has a space saving pent design which is also effective at preventing rainwater build-up. 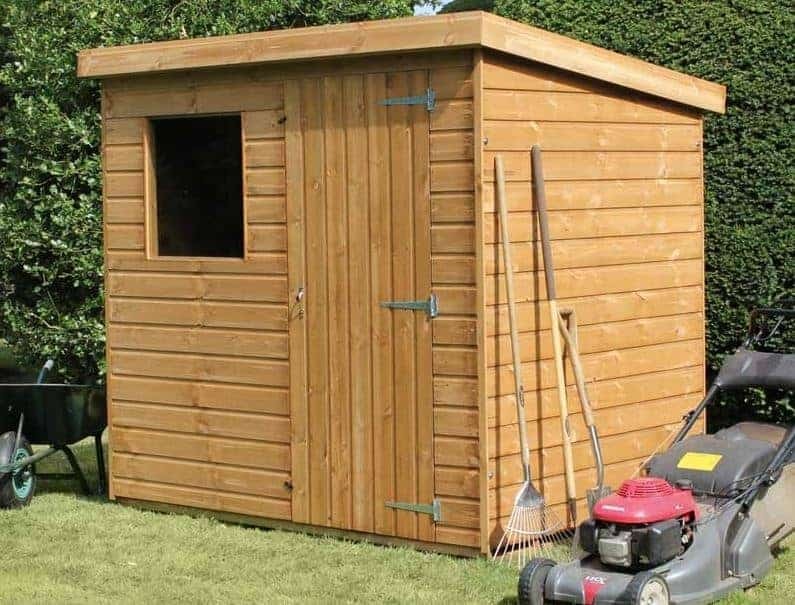 You’ll notice sheds with a pent roof have a more unusual design as they tend to be taller at the front than the back. This is to accommodate for the deep slope of the roof and it ensures the front of the building remains unaffected by even heavier downpours. What we really like about both the roof and the floor of these sheds is they are constructed from thick, rigid tongue and groove. It’s more common to find solid sheet materials in storage sheds these days so the tongue and groove gives this a much higher quality. It also allows you to store whatever you need to regardless of its weight as you have the reassurance that the floor will withstand even heavy equipment, tools and machinery. It isn’t the style of cladding used on this shed that sets it apart, it is the type of timber used. Treetops Traditional uses DEAL Redwood timber with a PAR finish. Now if you’re not a DIY enthusiast you may not know what the PAR element stands for. It basically means the timber is planed down from the size stated. So when you see that this model has a 12mm PAR finish, it basically means the thickness of the cladding was thicker but it has been planed down to 12mm. 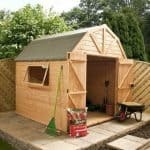 This doesn’t deter from its quality however as the cladding on this shed is super-durable and capable of withstanding practically whatever life throws at it. Shiplap tongue and groove is a fantastically sturdy cladding type. The walls have a strong, draft-free interlocking design and an expansion gap is provided to protect the structure if seasonal changes occur in the timber. Another rigid-boosting feature is the thick 44mmx27mm framing. This is a lot thicker than a standard frame and therefore offers a lot more stability. Treatment wise the timber is dip treated prior to delivery. So basically it’s protected against any damage that could occur during transit. It is recommended that a treatment is applied within 6 weeks of installation and then continued every year to provide a full weatherproof structure. 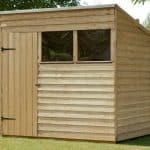 The door and the window supplied with this shed can be customised. This is highly unusual and is one of the main advantages of the Treetops Traditional range. More information about the customisation options can be found further down the review. For now let’s talk about what you receive as standard. The shed comes with a single, well braced door. This is also securely hinged in three places, rather than two. So you can see that it has been constructed with heavy use in mind. It isn’t going to sag over time and it is also constructed from the same high quality timber as the rest of the building. It also comes with a small fixed window. This is also unique as most sheds tend to feature styrene glazing. Whilst this is safer than glass, it isn’t as thick. So this shed offers a more insulated, better quality finish. You can’t fault this shed for security. The door comes with a key operated lock that is built into the wood, rather than simply placed on top. This makes it harder for thieves to get into and keeps whatever you store completely secure. Privacy wise it can be as private as you want it to be. The fixed window that comes with the shed is pretty small, though curtains could be placed behind it to cover your belongings. Another option is to opt for the windowless design which is just one of the customisation options available. All Treetops Traditional sheds come with the same range of customisation options, though some models have slightly more options than others. The Standard Pent range allows you to customise the door and the windows. With this model you can choose to get rid of the window, keep it as it is or change its fixed design to an opening version. Opening windows allow you to get plenty of fresh air into the shed, ventilating it to reduce potential damp related problems. Even though it is a very solid, weatherproof building, it can still become stuffy and potentially suffer from mould if it isn’t kept properly ventilated. If you chose to get rid of the window or keep it fixed, you can still ventilate the shed by leaving the door open during particularly hot days. It won’t cost you anything to get rid of the window, but it will cost a little more to change it to an opening model. There are two customisation options available for the door of the shed. You can choose both the placement of the door and whether you want a single or double door design. If you stick with the single door, it can be placed in three different positions. These include the centre of the shed or offset to either side at the front of the building. You will only be able to choose the centre option if you opt for the windowless design. Altering the position does not cost anything extra. If you choose the double door upgrade, it will be placed in the centre of the shed and it does offer more space to get in and out of the building. 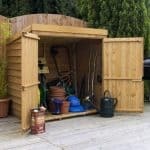 This is a very high quality storage shed and it is really built to last. Even the very smallest of details have a high quality design and no costs have been cut anywhere in the building. If it wasn’t for the annual treatments, this would receive 10/10 for longevity. The materials are capable of putting up with an extremely high level of wear and tear. Though it isn’t the biggest model available, this is definitely going to provide more than enough space for the average family home. It will easily store all of those gardening essentials. This is one of the easiest sheds to put together. It should only take 2-4 hours and it comes with everything you need to assemble it. This really does provide exceptional value and is worth the slightly higher cost over its competitors. Final Thoughts: We never fail to be impressed by Treetops Traditional buildings. This 7’x5’ storage shed is an extremely high quality model. Dip treated prior to shipment, the 12mm DEAL Redwood tongue and groove Shiplap cladding is strong, durable and capable of withstanding practically anything that is thrown at it. We love its customisation options regarding the door and window and the fact the door also comes with a key operated lock. Not many sheds of this size boast such a high quality, secure design. 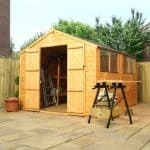 This shed is available in different sizes so be sure to check out the others before deciding which one is right for your garden.